Herd, Alex. "Dieppe Raid". The Canadian Encyclopedia, 30 November 2017, Historica Canada. 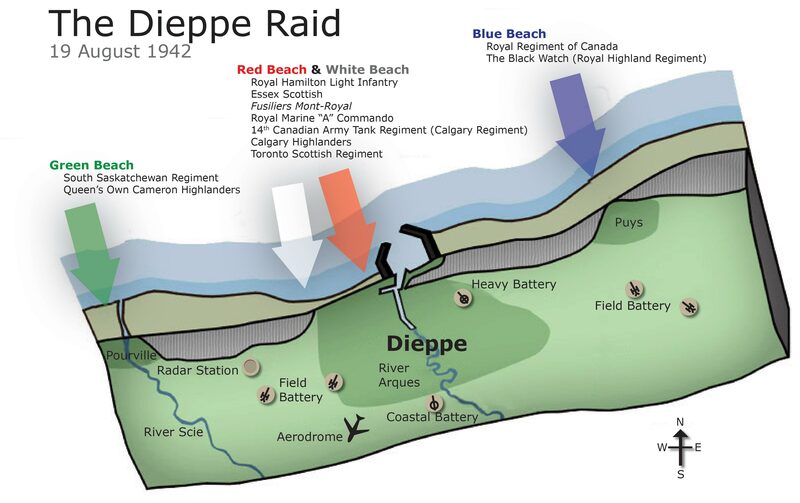 https://www.thecanadianencyclopedia.ca/en/article/dieppe-raid. Accessed 18 April 2019. During the Second World War, on 19 August 1942, the Allies launched a major raid on the French coastal port of Dieppe. 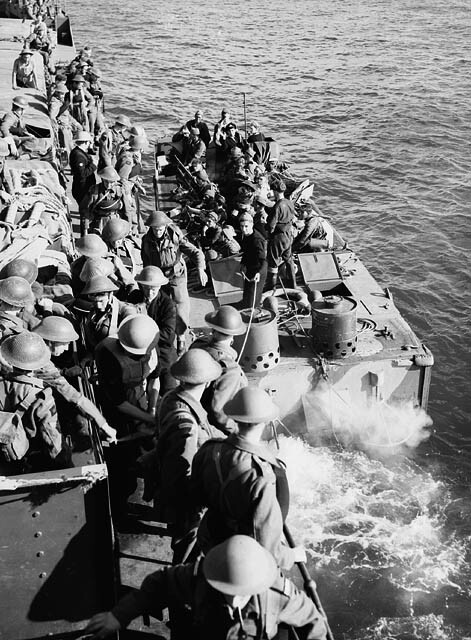 Operation Jubilee was the first Canadian Army engagement in the European theatre of the war, designed to test the Allies' ability to launch amphibious assaults against Adolf Hitler's "Fortress Europe." The raid was a disaster: More than 900 Canadian soldiers were killed, and thousands more were wounded and taken prisoner. Despite the bloodshed, the raid provided valuable lessons for subsequent Allied amphibious assaults on Africa, Italy and Normandy. Bodies of Canadian soldiers of the Calgary Regiment lie dead on the beach at Dieppe, France, following the disastrous Allied raid there on 19 August, 1942. By the summer of 1942, Canada had been at war with Germany for nearly three years, but its army had yet to see any action, except during the failed defence of Hong Kong. Thousands of fresh Canadian soldiers waiting in Britain were eager to get involved in the fight against Germany. 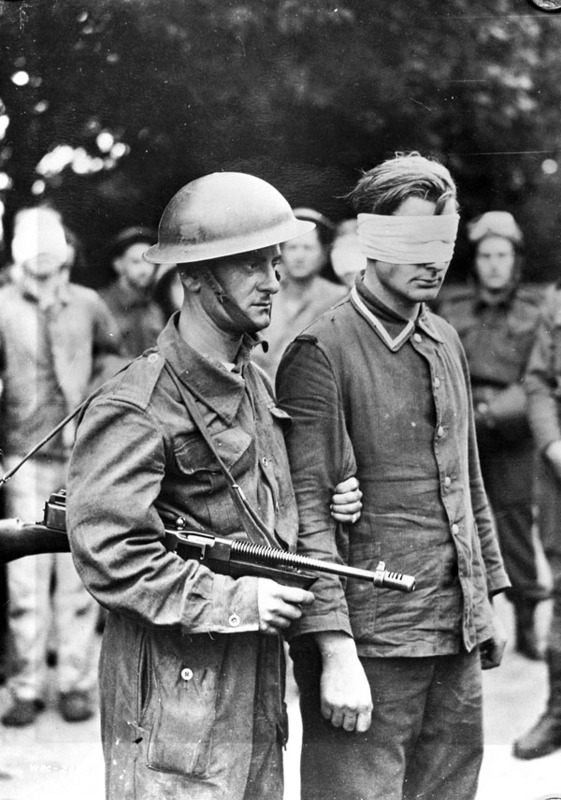 The British and Americans were fighting in North Africa, but the Soviet Union was pressuring the Allies to invade Nazi-occupied western Europe, to ease the burden on the Red Army struggling against Germany's invasion of Russia. The Allies weren't yet ready for a full-scale assault on mainland Europe. Instead, Winston Churchill, the British Prime Minister, wanted to mount commando-style raids against occupied France as a way of harassing the enemy. Churchill and Royal Air Force commanders also believed that such raids, supported by Allied aircraft, would draw the Luftwaffe, the German air force, into battle — thus wearing down the Luftwaffe and drawing its planes and pilots away from the Russian front. Louis Mountbatten, a senior British naval officer and relative of the Royal Family, had been appointed to advise British commanders on the relatively new military tactic of using co-ordinated naval, air and land forces in "combined operations" attacks. Mountbatten proposed a raid on the town of Dieppe — to probe German defences on the coast of France, and to test the Allies' ability to mount an amphibious assault, using combined forces, against Adolf Hitler's "Fortress Europe." 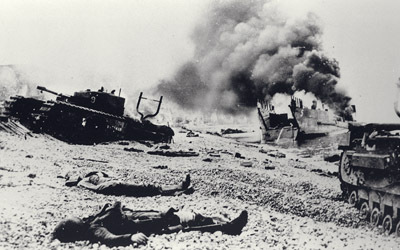 The plan was to take Dieppe, hold a perimeter around the town, destroy the harbour facilities, and then withdraw by sea. Lieutenant-General Harry Crerar and other senior Canadian army commanders endorsed the plan, and offered up troops for the raid. Not only were Canadian soldiers stationed in Britain itching for a taste of combat, but domestic opinion at home was eager to see the Canadian Army finally involved in the European war. 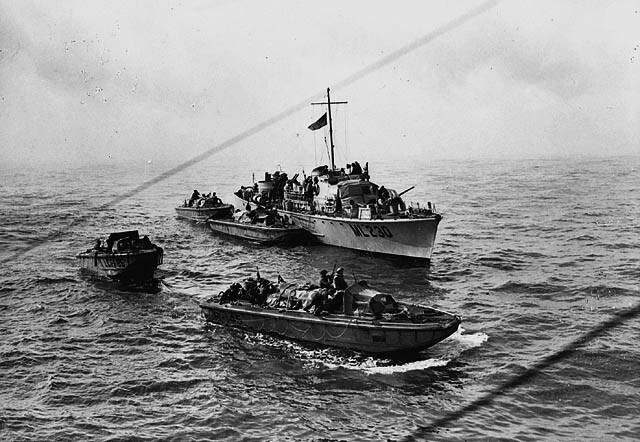 Launched across the English Channel from southern England, Operation Jubilee (as the raid was called) involved more than 6,000 soldiers — 4,963 of them Canadian, plus 1,075 British troops, 15 French nationals and hundreds of airmen and sailors from Canada, Britain and the United States. The 2nd Canadian Infantry Division, led by Major-General J.H. Roberts, formed the bulk of the infantry assault force. As Roberts told his troops before the raid — "Don't worry men, it'll be a piece of cake," — a comment that would haunt him for years afterwards. 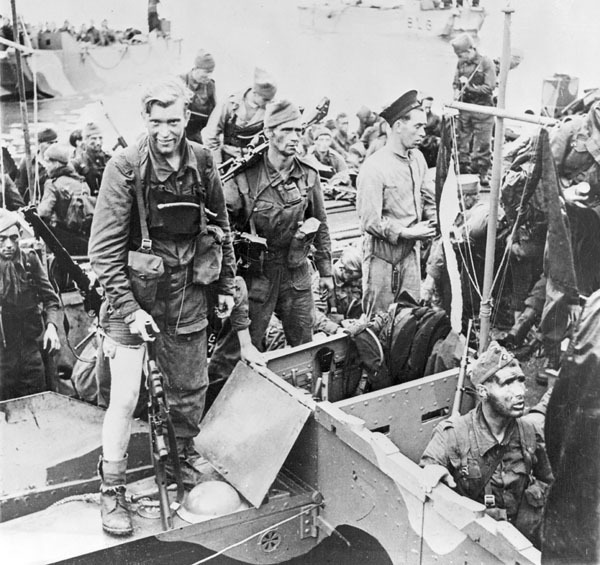 Canadian soliders board landing craft for their run-in to the beach, during the raid on Dieppe on 19 August, 1942. In the early morning hours of 19 August, the Allies arrived off the French coast on a naval task force of 237 ships and landing craft. Although the shoreline of Dieppe itself is relatively flat, the town is bookended on both sides by high, chalky-white cliffs rising directly from the beaches. From these cliffs, heavy German guns and machine guns situated inside concrete bunkers guarded the port and its surrounding beaches. 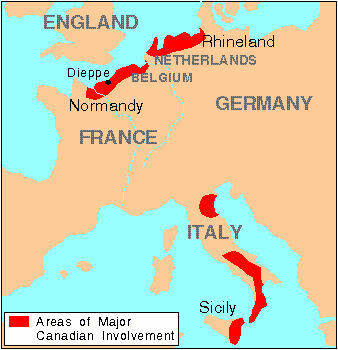 The Canadians assaulted Dieppe at four designated sections. At Blue Beach, below the village of Puys (1.6 km east of Dieppe), troops of The Royal Regiment of Canada and The Black Watch (Royal Highland Regiment) of Canada arrived late in their bid to take out enemy artillery and machine. From the start the enemy pinned down the Canadians and shot them up until the raid was over. On the other side of the town at Green Beach, by the village of Pourville (4 km west of Dieppe), the South Saskatchewan Regiment arrived on time and in the dark. Unfortunately, the part of the unit tasked with reaching a radar station and anti-aircraft guns to the east of Pourville landed on the west side of the River Scie, which ran through the village. These troops had to cross the river on Pourville's only bridge, which the Germans ferociously defended. Ultimately, both the South Saskatchewans and Cameron Highlanders of Canada were pushed back. At Red and White Beaches directly in front of the main port, the Essex Scottish and Royal Hamilton Light Infantry (RHLI) regiments landed without their armoured support, the 14th Canadian Army Tank Regiment (the Calgary Tanks), which was late. The enemy, from higher ground and in the town's beachfront casino, hit these units hard. Some infantry managed to get off the beach and enter Dieppe, but the Canadians also failed to achieve their objectives here. 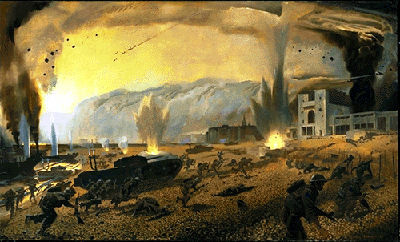 A painting by Canadian war artist Charles Comfort, of the Allied raid on Dieppe in 1942. On a ship offshore, Maj.-Gen. Roberts, believing that more troops had made their way into Dieppe than was true, sent his reserve unit, the Fusiliers Mont-Royal, to take advantage. This regiment was also destroyed. Meanwhile, the Calgary Tanks that did arrive onshore were restricted in their movement, many becoming bogged down by the shingle beach (consisting of large pebbles, known as chert). Some tanks made it into the town, but their guns were unable to destroy the enemy's concrete barriers that lay in their path. Those tanks that survived the assault provided covering fire for the force’s evacuation. Wrecked Allied tanks and landing craft lie strewn across a beach at Dieppe, France, following the failed raid there in 1942. The raid was over by mid-day. In nine hours, 907 Canadian soldiers were killed, 2,460 were wounded, and 1,946 were taken prisoner. That's more prisoners than the Canadian Army would lose in 11 months of fighting during the Northwest Europe campaign of 1944-1945. 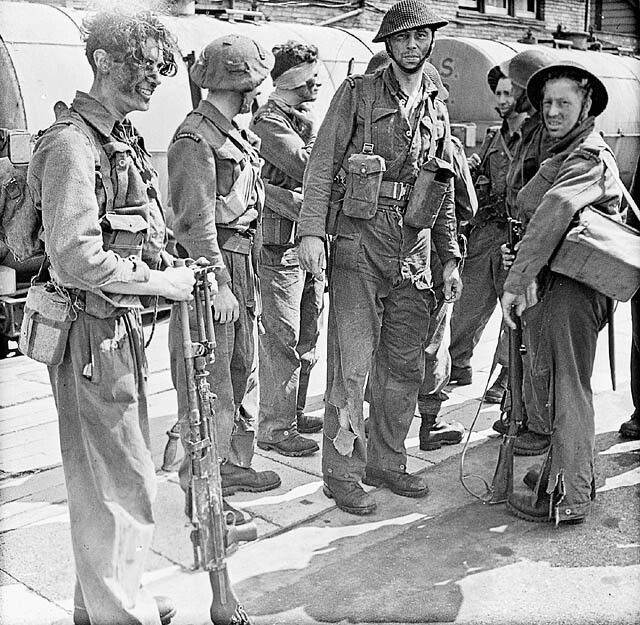 Fewer than half the Canadians who departed for Dieppe made it back to England. 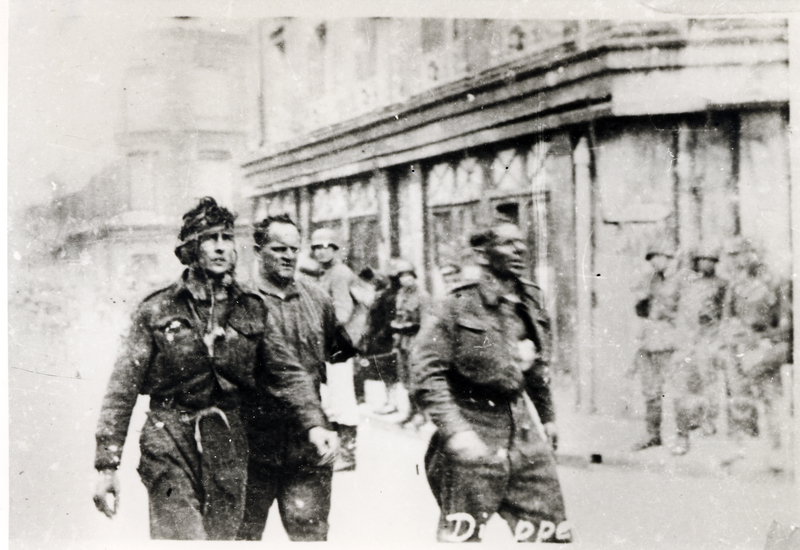 Allied soldiers taken prisoner by the Germans at Dieppe, France in 1942. 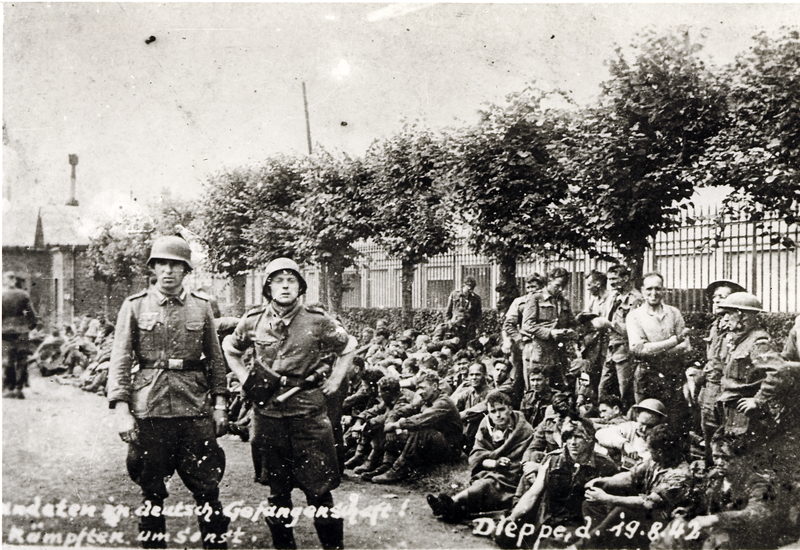 German soldiers guarding Allied prisoners, following the raid on Dieppe, France in 1942. The British lost 300 men killed, wounded and taken prisoner, and there were 550 Allied naval casualties. In the air battle overhead, the Royal Canadian Air Force lost 13 planes and 10 pilots, out of 106 Allied aircraft and 81 airmen lost overall. Only British commandos, assigned to subdue coast artillery batteries to the east and west of Dieppe, enjoyed some success. And for the Canadians, the day was not without heroism. Honorary Captain J.W. Foote of the RHLI, and Lieutenant-Colonel C.C.I. Merritt of the South Saskatchewans both received the Victoria Cross, the British Empire's highest award for military valour. Foote, a chaplain, helped care for wounded troops under fire. Merritt bravely led his men over the Pourville bridge and later commanded a rearguard that allowed some troops to escape. Both were taken prisoner. German casualties were light, other than the 48 aircraft lost after the Luftwaffe was drawn into battle. Canadian survivors of the Dieppe Raid, upon their return to England on 19 August, 1942. Allied commanders knew the raid was risky. But none imagined it would be such a terrible failure, with so much loss of life. The planners believed the element of surprise would allow landing troops to overcome German defenders and occupy the town, before withdrawing. Little thought was given to the importance of air superiority and the need for overwhelming firepower, including artillery support from naval warships. The assaulting infantry had only light destroyers firing at the Germans from offshore; no battleships or cruisers were made available for the raid, nor heavy bombers overhead. Instead, strategists put their faith in the power of tanks. Tanks had spearheaded the German blitzkrieg across Europe in 1940. Two years later, tanks were seen as providing a crucial advantage in modern warfare. More than two dozen tanks would land on Dieppe's beaches beside the infantry, and this, planners said, would make all the difference. However, of the 29 tanks that attempted to land, only 15 made it off the beaches and reached the town's promenade. Their guns were not powerful enough to knock out German fortifications. Said Second World War historian Terry Copp: "Army planners were still mesmerized by the vision of tanks as the decisive weapon of war, and surprise as a substitute for overwhelming firepower." Despite its failure, the raid provided valuable lessons for the Allies. It erased the idea that surprise and tanks were enough to succeed in an amphibious assault against occupied France. Two years later, the D-Day landings would be backed up by massive naval artillery support, dominance over the skies, and heavy firepower — three essential factors missing at Dieppe. 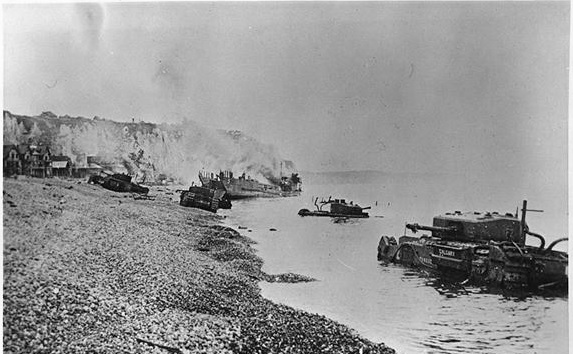 Dieppe also made clear the difficulties of assaulting a well-defended port, as well as the need for better intelligence on beach conditions and German defences, better communication between infantry on the beach and commanders offshore, and the need for specialized landing craft and tanks able to overcome beach obstacles. These lessons would be implemented in later amphibious assaults in North Africa, Italy, and Normandy. The sacrifices of Canadians at Dieppe are well remembered. Few Canadian military engagements have been as attentively researched and documented by historians. Today, the town of Dieppe is filled with maple leaf flags and Canadian symbols, and its seafront promenade holds a park and several memorials to the regiments that came ashore in 1942. The Dieppe Canadian War Cemetery also holds the graves of 944 Allied servicemen and women, including 707 Canadians. Perhaps the finest tribute to the men who fought and died at Dieppe is the official report on the battle in 1942 by the German army: "The enemy, almost entirely Canadian soldiers, fought — so far as he was able to fight at all —well and bravely. 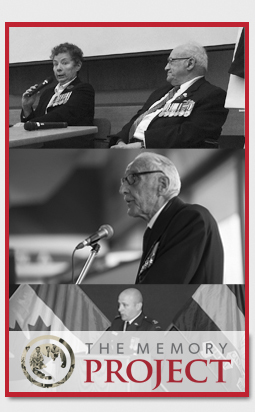 Robin Neillands, The Dieppe Raid: The Story of the Disastrous 1942 Expedition (2005); Mark Zuehlke, Tragedy at Dieppe: Operation Jubilee, August 19, 1942 (2012); David O'Keefe, One Day in August: The Untold Story Behind Canada's Tragedy at Dieppe (2013).